It&apos;s baseball&apos;s All-Star Break, and they could not have chosen a more ideal place for fans and players alike to relax. This year, San Diego plays host to the Home Run Derby and the All-Star Game, meaning picturesque Petco Park serves as the backdrop while you slam some local beers in the warm sun with a plate of tacos at your side. Wil, what are you doing bro? The Padres are having a hard enough time bringing their fans to the park. Are you trying to alienate literally everybody within San Diego County? To be fair to Wil (and we&apos;re giving him plenty of leeway here after that bombshell-of-a-bad-opinion), he grew up in North Carolina and his path in professional baseball before the Padres never brought him anywhere close to California. And since he&apos;s having such a good season so far, maybe he hasn&apos;t had the time to hit up any taco trucks in the area? I wonder what other #HotTakes Wil Myers might have? Wil Myers: "It ain&apos;t real guacamole if it don&apos;t got no peas." Wil Myers&apos; favorite cheesesteak joint is Subway. TACO SHOP LADY: Hot sauce? WIL MYERS: No thanks, I have a bottle of lukewarm ranch dressing in my fanny pack. 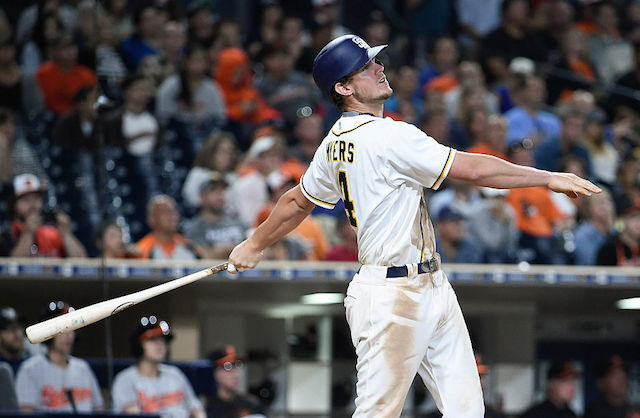 The 2016 Home Run Derby is tonight and Wil Myers is one of the contestants. I hope he loses.